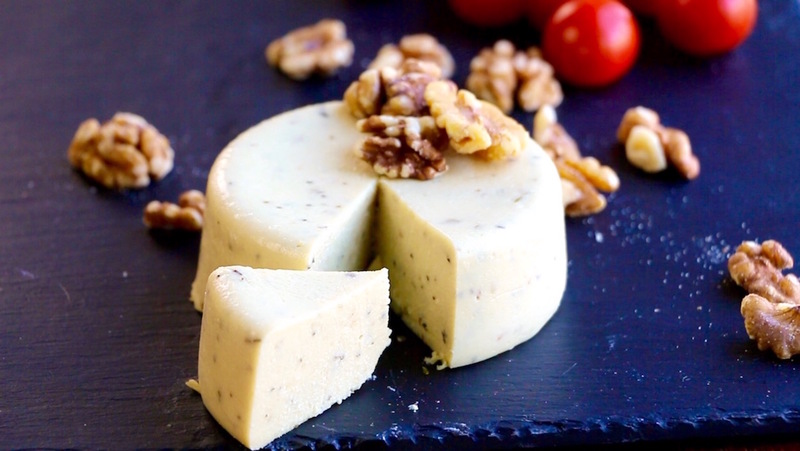 Making vegan cheese has never been so easy. This garlic and herbs cheese is delicious, dairy free and has no added oil.It is made of cashew, agar powder, nutritional yeast and spices. Serve on bagels, bagel chips, crackers, or celery. Enjoy! Oil, to brush the ramekin. Soak the cashews 1 hour in hot water. Drain the cashews and place them in a blender along with the basil, oregano, garlic, salt, cornstarch, nutritional yeast, lemon juice, maple syrup and 1/2 cup water. In a saucepan combine 1/2 cup water and agar agar powder. Add the cashew cream and bring to a boil stirring constantly. Pour into lightly oiled ramekins and refrigerate at least 2 hours. Made this a couple of days ago. It was delish. Not a thing I’d change about it. Not a hard cheese, more like a spreadable cheese. Served it with healthy crackers. No one knew it wasn’t cheese! Love your recipes, always good! Keep them coming please! Very good recipe! !, thank you! délicieux !!!! delicious thank you for the receipe! Fantastic recipe but it won’t upload to share via email, it just sends a blank email. This does not detract from the joy I get from these recipes though…..just an irritation. This is great! I have missed cheese for 2 years now. This is the best thing I ate since two years. Thank you so much! Have made this cheese several times now and everyone loved it. So easy and delicious. Thank you. Great recipe. So simple. Could you do a feta flavoured or goat cheese please. I miss those flavours. This is a brilliant recipe – I couldn’t believe how easy it was to make. It will be a regular in my kitchen from now on. Does the lemon juice have to be fresh or will it work with bottled lemon juice as well? It looks super delicious, can’t wait to try it! Hi, I think this recipe is easy enough to prepare and looks so so yummy. Looks delicious, has anyone had any success with other nuts i.e almonds or walnuts? I’m stunned. I never used agar before and found it in my Asian market for $1.30 per packet!! I made it following the directions but I think I put too much basil in there and the sweetness was too much (user error)…so I made another batch with just nutritional yeast flakes and it looks like cheddar. I can’t stop talking about this site and the use of agar, I’m baffled that this is not more well known! Thank you so much for the recipe and introducing me to a whole new level of cooking. This has become our go-to spread and vegan cheese at home. Thank you for this recipe! I just made it today. It came out perfectly . Thanks so much for the presentation and recipe . However, I am not sure what kind of cheese I just made ? American cheese, cheddar cheese or Suisse cheese ? Please give me the name of this cheese ? I just to want to say thank you for your kindness in sharing your recipes with us all. Some asian markets sell agar agar with sweet iingredient in it , maybe that what makes it so sweet? Was tryong to reply to suzanne ???? Sorry if somebody already asked this. Will Agar Agar flakes work okay instead of powder? Or will that effect the consistency? If yo use agar flakes you’ll have to double the amount! I used bottled lemon juice and it worked fine. To Suzanne – I had a product called Gel-It-In (which can be purchased from Woolworths) and it is a replacement for Gelatin. One “tube” will set 200 grams of liquid, so I used one and a half “tubes” to make this Cheese and it worked fine. Use exactly the same as Agar (heat in a saucepan to activate). There is no sweetner added to Gel-It-In. Thanks for the jalopena suggestion. What a delightful twist on this wonderful recipe. Made this over the weekend but the colour was grey/light green, not like the lovely colour of the one in your video. Used a nutribullet and instead of cornflour used organic arrowroot. 1 and a half teaspoons of this and the same for Agar. Consistency a little jelly-like. A feeling i’ve done something wrong! Otherwise, great flavour! How long does it keep in the fridge and can you freeze this. I’m a great fan of your work – thank you so much!! This recipe was great, and a big hit with vegan and non vegan friends alike. Will the recipe work if I want to double or triple the amounts to make more servings? Yes it should work if you double the amount! Love this ❤️, thank you Buddhist Chef ???????????? can’t seem to facebook any of your recipes to share them with my friends? Do you use raw cashews or roasted? Thank you for your wonderful recipes. You inspire me to explore again in the kitchen! Thank you, you can use both, for this recipe I used roasted but unsalted. I like this website, it’s very helpful. Simple recipes with crystal clear instructions, well made videos. I just saved it in my favorites. Thank you for sharing. Did you use nutritional yeast powder or flakes (in the video it looks like flakes)? Do you half the amount if using powder nutritional yeast? Just found this site today. Thanks for the recipe. I use flakes, I didn’t know there was powder nutritional yeast! Curious if anyone tried adding different ingredients like sun dried tomatoes or chipotle pepper? Sure, otherwise you can increase the amount of agar agar a little! This looks really good. what happens if the maple syrup is left out? Could I use tapioca starch instead of agar agar? It’s a vegan thickener pretty easy to find but make sure you use agar powder not agar flakes! Hi, would this work using almonds? Wow!!! This is so delicious. I used tapiocabstarch instead of cornstarch only because I didn’t have cornstarch and wanted to try this asap. Yummmmm!!! I’m so glad to have found this recipe. I will buy everything and do it tomorrow. Can I replace maple syrup with some honey ? Can you substitute agar fir guar gum? So I replaced basil + oregano with mixed bell pepper flakes + chipotle powder, I used 1/4 tsp of chipotle powder and 1 tsp of mixed pepper. It tastes great, filled two ramekin so I feel like somehow I’ve used too much water; the taste is definitely spread out a bit thin for my liking but it’s an easy enough mistake; that said it is satisfying and slices nicely. I’m not too fond of mint so I’ve avoided basil + oregano. Can I substitute any other nuts for cashews? I have a bunch of sunflower seeds that need to be used up! Yes, you should always double the amount when using agar flakes! I would love to be sent recipes to my email address – do you do this? Nutritional yeast is used mainly for the taste, it has a cheese like flavor ! Which cheese would you compare the firmness to, it looks like Edam. Can it be sliced for sandwiches or is it more of a soft spreadable cheese? It’s more of a soft cheese! I didn’t have agar agar at home so I used ground arrowroot and it made an excellent cream cheese!!! Worth a try, it is nice too. Hice la receta. Fue muy fácil y el resultado muy bueno. Aunque no usé levadura nutricional, no la encontré. Usé levadura de cerveza. La próxima vez tengo que probar con la levadura nutricional. Can I replace it with honey? I made this yesterday, I had it on a pitta bread toasty & it was delicious. Same exact way I feel! Yes I saw and almost bought the agar with the sugar in it. But then fortunately I was able to find just the powder. It’s cooling in the fridge now. I’m dying to try it. Hello excuse me. How many grams of cashew nuts are exactly half a cup? I am Spanish and here we measure in grams. Thank you very much! Can nutrition yeast be avoided in making this vegan cheese? Hi! I made this recipe last night and it’s delicious, but the texture is very soft, kind of jelly-like, which unfortunately I can’t stand 🙁 I was wondering if it is okay to make another batch using a bit less water and and add the first one in to get a final product a bit firmer? I’d be reheating it but I’m not sure if that’s bad? could you add some miso paste for a more fermented flavor? Can you recommend a fairly simple dessert cheeze to offer with fresh fruit ? This is my go to recipe when I bring an appetizer to a party. Everybody loves it and everybody wants the recipe. I think the balance of spices is just perfect, so glad I found The Buddhist Chef! Hi, not sure if this has been asked already — can this be used on pizza? Do you have a hard cheese recipe for pizzaa? 😀 Happy Thanksgiving, from Taipei! Can you use other nuts? Sure! Like macadamia nuts ! How long does it last in the fridge?would it last for a week? Macadamia nuts should work too! Absolutely amazing!!! This is my first time making vegan cheese and I’m so pleased! It was very easy to make, and it’s DELICIOUS. I first saw a different recipe for vegan cheese that I was going to use, but the measurements were in grams and I didn’t know how much agar powder to use (I’m in the U.S.). I think it was also a little more complicated. Anyway, thank you SO much for this! I will definitely be making this regularly. You can skip it maybe, it will be softer ! Just triple the volume if using flakes, so 4.5 tablespoons of flakes. I just made it that way and it worked. It was a hit with non vegans! I loved loved this cheese. I am so glad I doubled the recipe. Between 3 people we ate one of these, and the second one I ate some for breakfast. I used fresh basil, garlic, and lemon in mine, and a little extra nutritional yeast. I was indeed licking the pot by the end. I will for sure make this again! Just enough for the mixture to thickens, 1 or 2 minutes ! What can i replace for the agar ? Help! Why does my agar taste so awful? Tasted of nasty chemicals or something weird. It ruined the batch. 🙁 Threw it out. Agar should be tasteless, it’s a bad batch! It happened to me once and now I smell it first. Just wondering why a lot of recipes cook the agar agar in water first then add to blended ingredients? Your recipe cooks all ingredients together including the agar agar, is there a difference? Can this be frozen and grated as needed? I made it today for the first time and it is the best vegan cheese ever! !